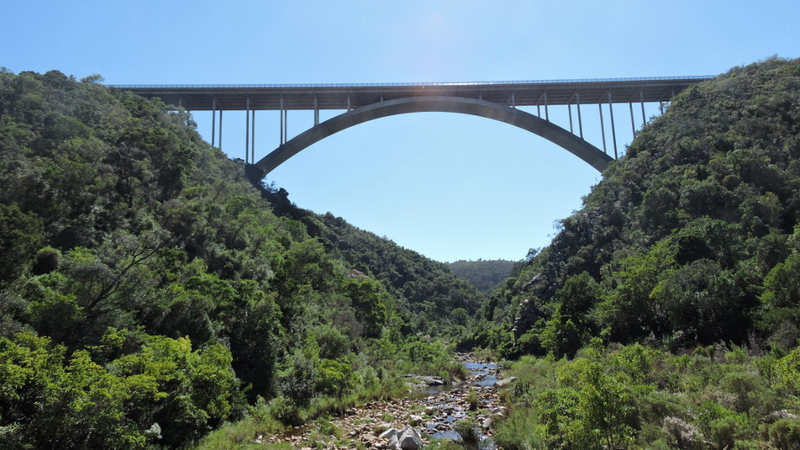 One of the most touristy areas in South Africa is without doubt the Garden Route. It even has its own beer. Reason enough to dedicate a blog entry to it. Where is the beginning and end of the Garden Route? Opinions differ. 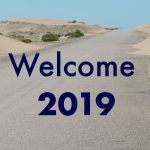 Officially it starts in Mossel Bay and ends in Jeffreys Bay (or the other way round). It’s not a designated road but rather a region between those two cities with George at its heart. The N2 is the main road connection through the area. Cyclists should use the R102 as much as possible, it adds 300 kilometers (but cuts down on traffic). It’s worth it to make detours to the south and the north, I only went south to the ocean. 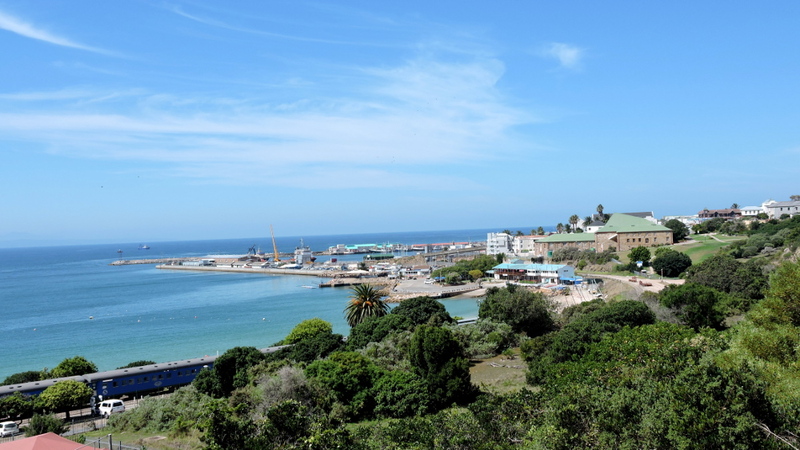 In the past, Mossel Bay was a quaint fishing village. Nowadays, like most South African towns, its downtown is dominated by chain stores such as PEP and Shoprite. In between there were a few old stone buildings turned into art galleries. Commerce is king. 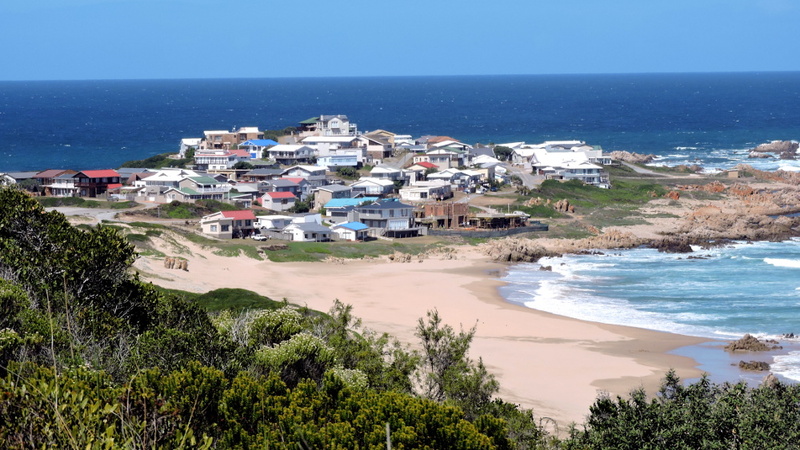 Expensive villas were nestled in the mountains around Mossel Bay. The N2 from Mossel Bay to George is a freeway and cyclists should take the R102. 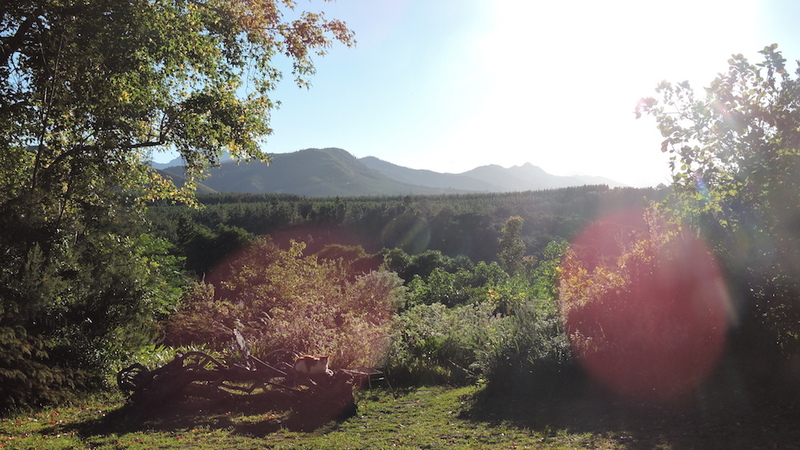 After Groot Brakrivier it got very picturesque. I’d have missed the town if it hadn’t been for a tip to stay at the nice Pine River Campground. The R102 runs through the pretty village. 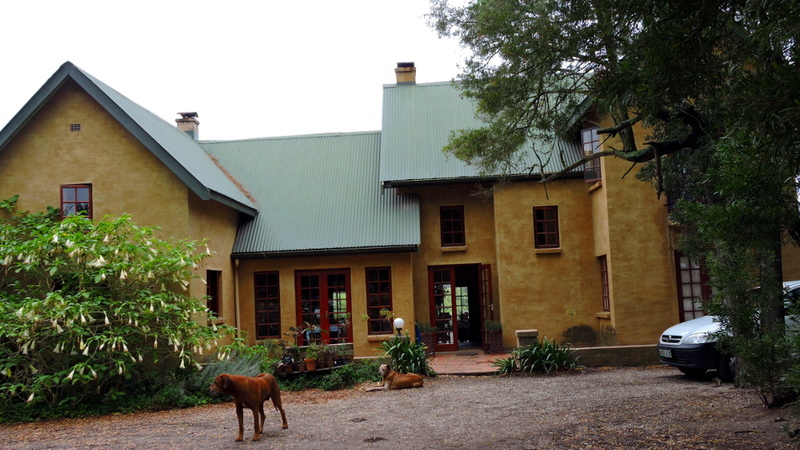 Between fields and across hills, it was a slow ride to George, the largest city on the Garden Route. There were impressive mountains in the background. In George there were plenty of stores to restock and I came passed several bike shops. 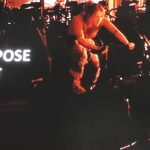 I bought an affordable bike computer (see my last blog). After George the R102 disappeared for a while because there was no space for a second road between the mountains, valleys, and the sea. The traffic was a bothersome but the scenery was breathtaking. Afterwards it was less mountainous but remained beautiful. 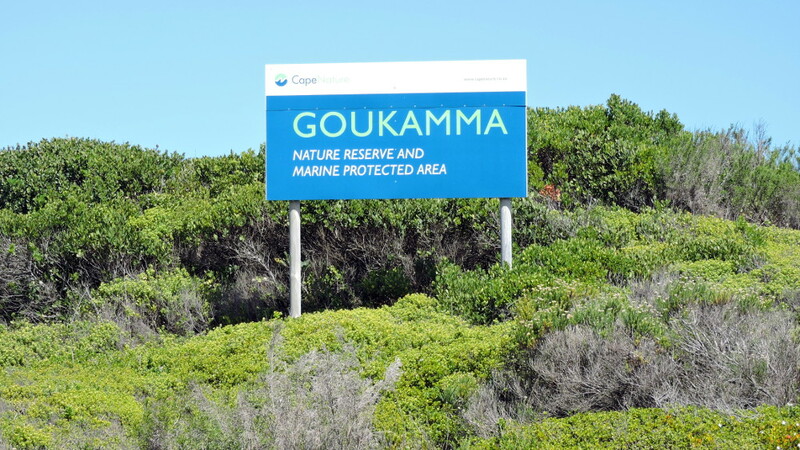 The Goukamma Nature Reserve had endemic flora along the coast. 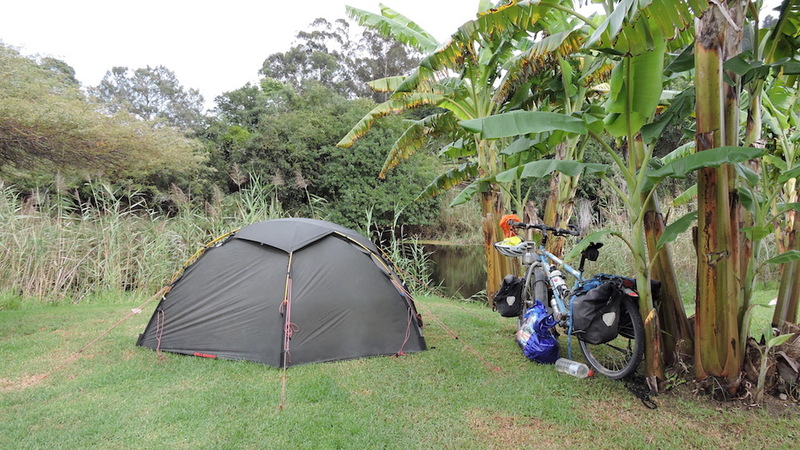 At the turnoff to Buffels Bay there was a nice small backpacker, Riverdeck, where I pitched my tent next to a creek under banana trees. 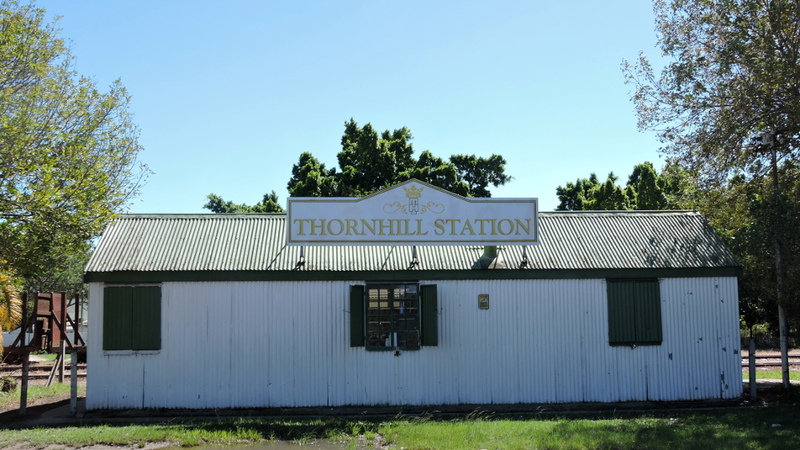 It was worthwhile to stay here for two nights. Buffalo Bay was very enjoyable and already on the way there, there was plenty to see. In the bay the ocean pounded the rocks. The village is beautifully situated on a peninsula. There were well-marked hiking trails which allowed to explore the whole area. 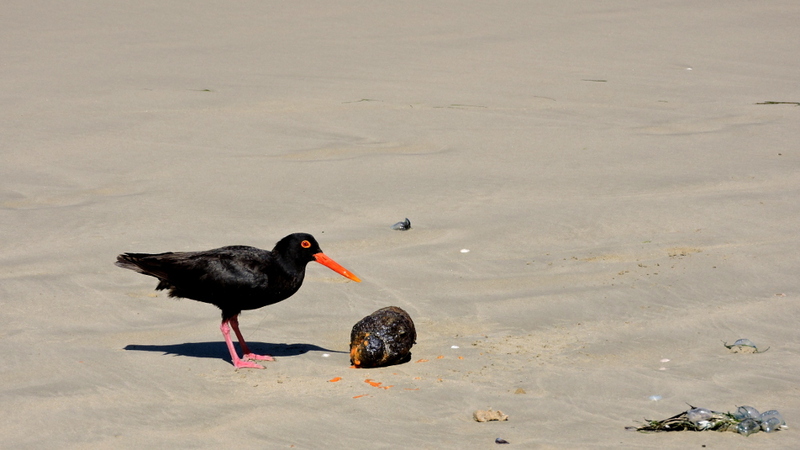 When I got to the pretty beach, I almost regretted not having brought my bathing suit. 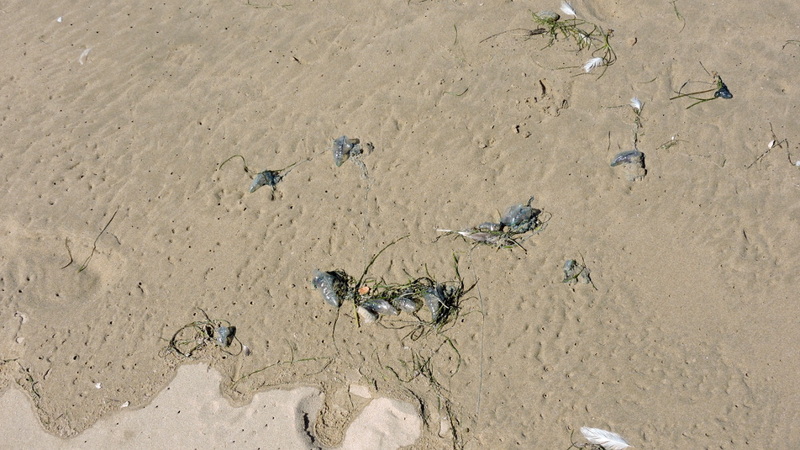 But when I saw all the small Bluebottles (small jellyfish with few but long tentacles), I no longer felt like swimming. But it was mainly mud and there was a lot of traffic. 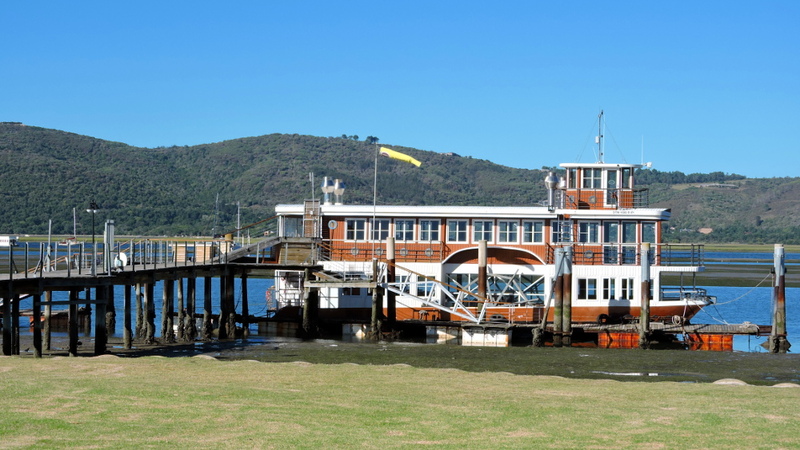 People had raved about Knysna but the only things special which I discovered was the sightseeing boat. 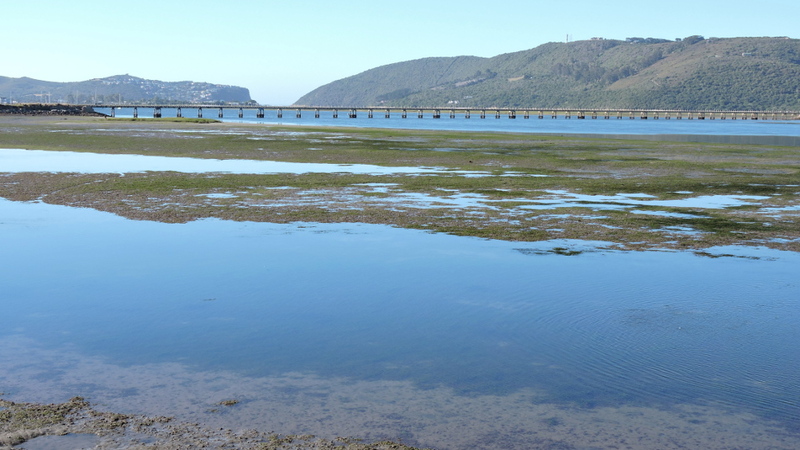 In my search for the “pretty” Knysna, I ended up downtown with its typical chain stores: Pick&Pay, PEP, Clicks. Then it was another ten kilometers uphill. When the last houses disappeared behind me, traffic halved. 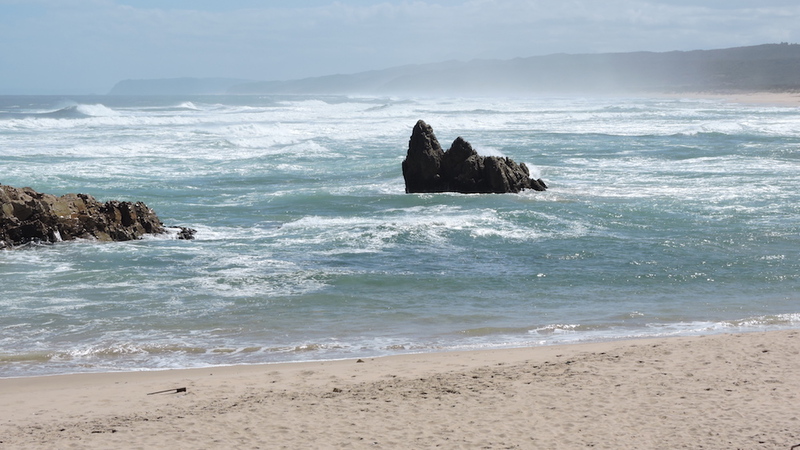 A few kilometers before I reached Plettenberg Bay, I met two cyclists who suggested that I take the turnoff to the airport in Plettenberg Bay. After a short distance, I could finally leave the N2 and now cycled through quiet farmland. What did it matter that it was a bit longer? The only drawback was that I arrived downtown and now had a steep climb to rejoin the N2. After that it was once more downhill and then another ten kilometers up. 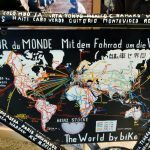 At a gas station/farm stall I met two cyclists. 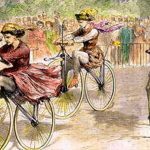 Instead of pannier bags they carried musical instruments and music stands. They had a performance at a backpacker’s in Nature Valley. I followed them to Wild Spirit, an amazing place in the middle of the forest. 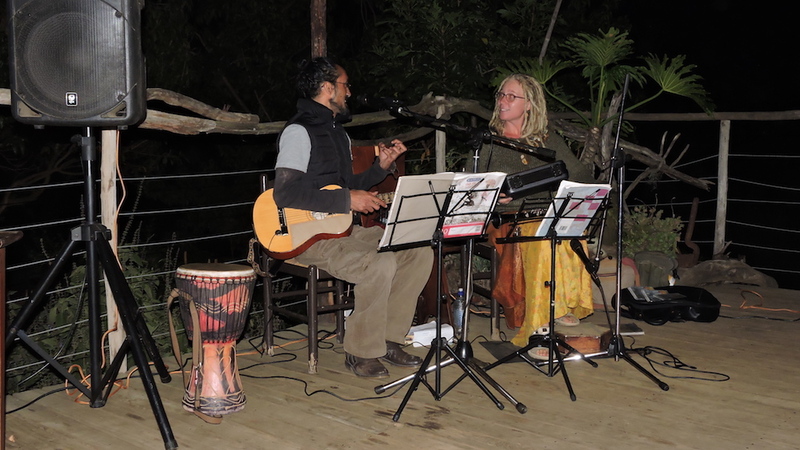 The duo “Driftwinds” made music to suit the place. The next morning, I had important visitors. 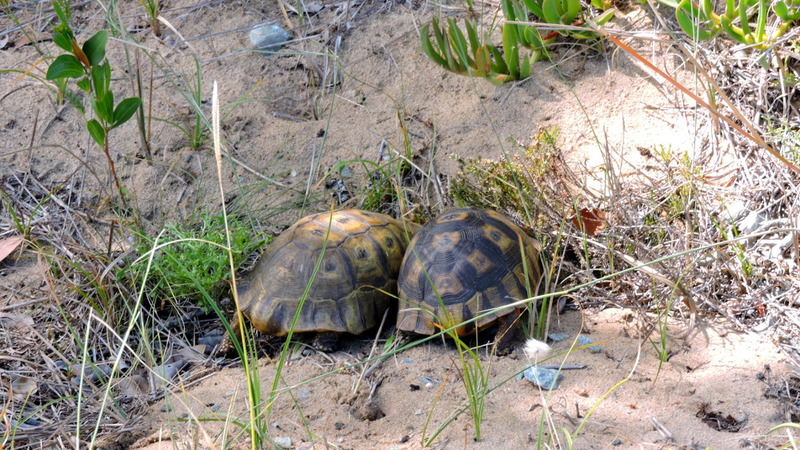 They disappeared more quickly than the elephants in Namibia and were less dangerous. 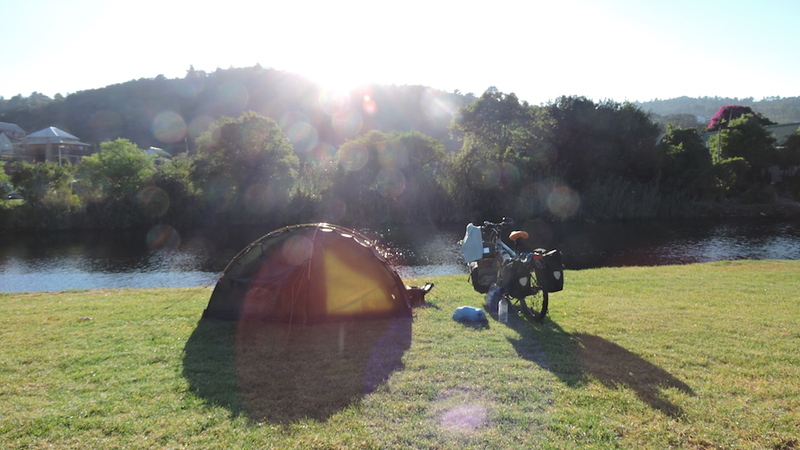 Before I headed to the next part of the Garden Route with its deep gorges. 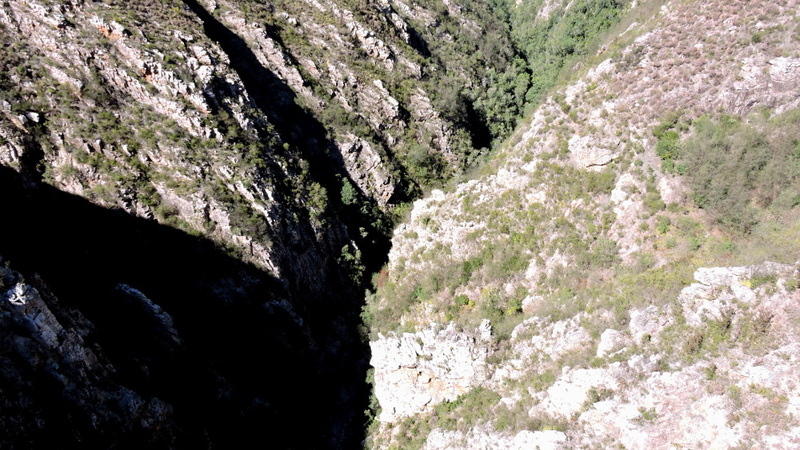 High bridges cross these deep gorges. On one of them was apparently the highest bungy jumping in the world with 216 meters. That should be sufficient for a few minutes of adrenaline rush. A few kilometers further on, motorbikers finally came into their own. 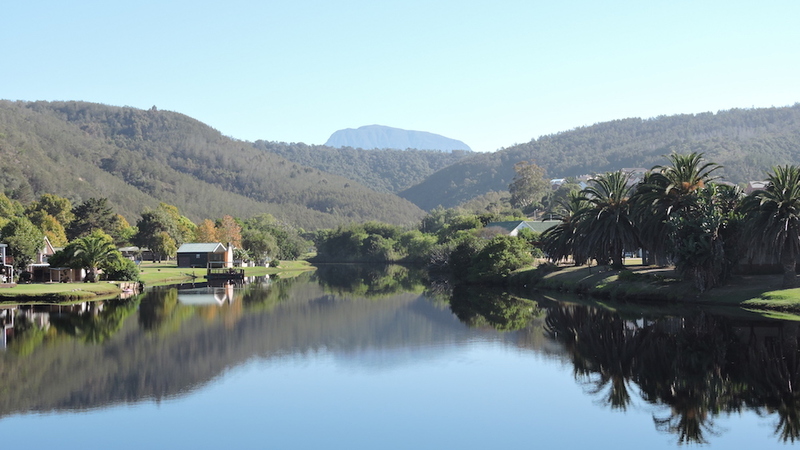 Storms River is a meeting place for bikers, preferably Harley’s. There were other tourist attractions as well, such as canopying, where one flies through the canopy of the Tsitsikama Rainforest clipped into a rope. 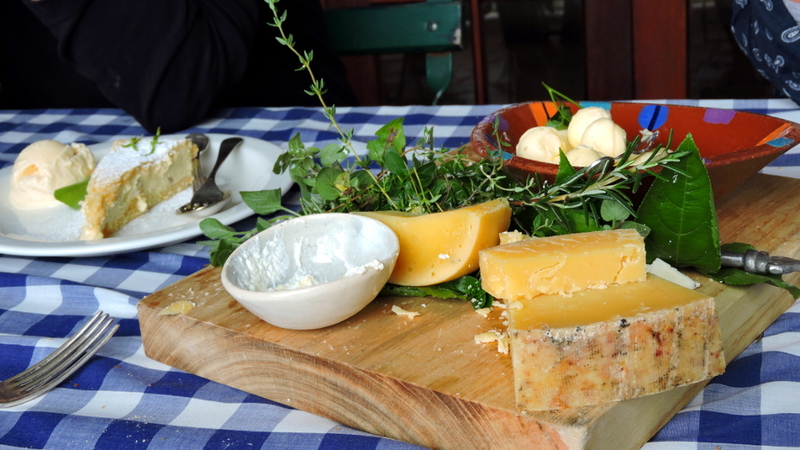 Close by is an insider’s tip, the cheese maker Fynboshoek. In this building which is reminiscent of Tuscany, Alje van Deemeter offered delicious cheese platters. Each cheese and the bread are made by hand. The salad is grown in the vegetable garden. The place is a real jewel. Finally, the R102 started again but I left it soon because I wanted to follow the coast. On gravel roads I cycled to Oyster Bay. In the past this might have been a nice place and perhaps it still was during the summer and school holidays. Today it looked desolate and empty holiday homes dominated. No chance for stealth camping because everything was fenced in. With good reason because there were game parks. When I saw the gnus (wildebeest) I didn’t want to camp next to them. 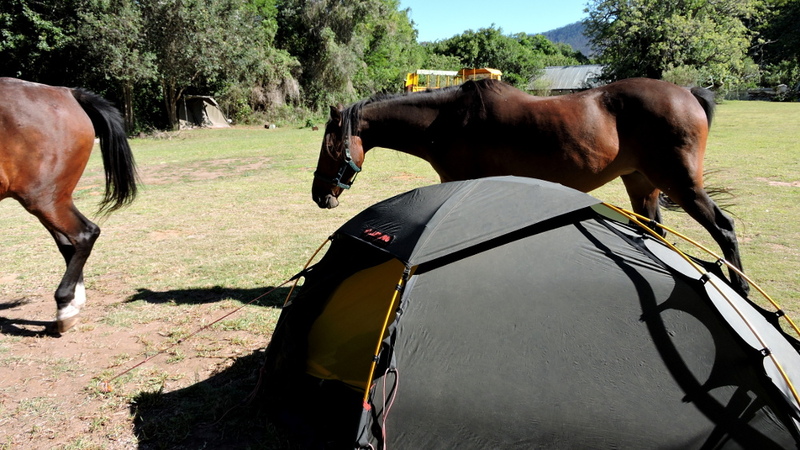 And the wind parks also needed to be fenced in and were much too noisy for camping. 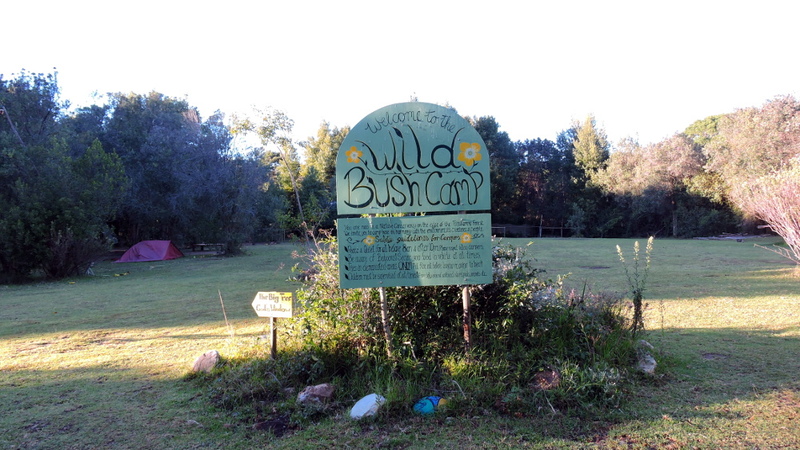 Slowly I approached the official end point of the Garden Route. 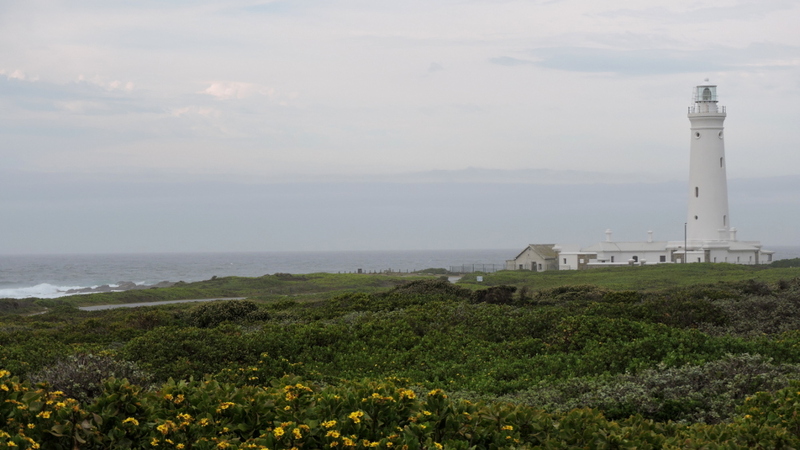 Even so the weather wasn’t too nice, I took a detour to Cape St. Francis Bay. On account of the weather it was very quiet. 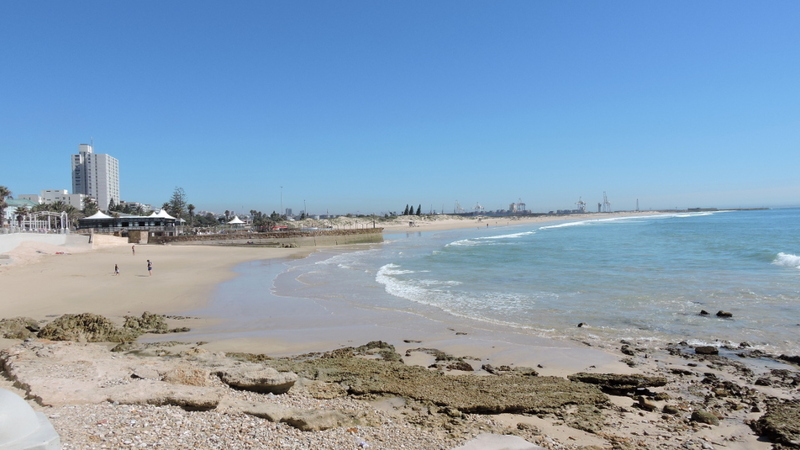 Jeffrey’s Bay, the official end point of the Garden Route, is a surfer’s paradise and there was more activity. 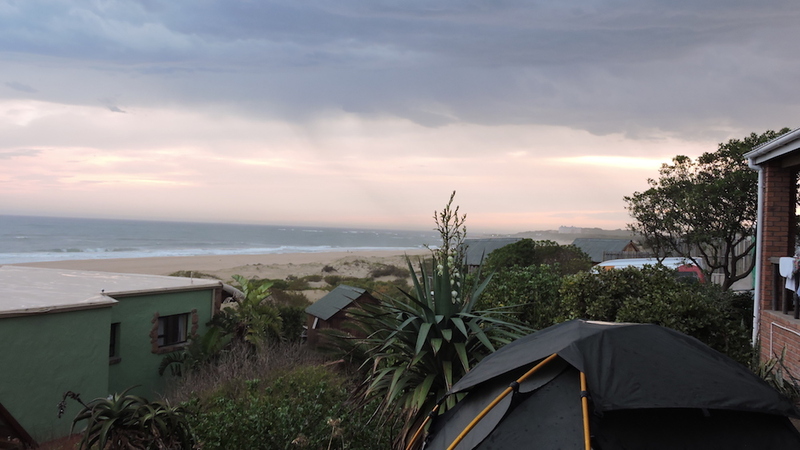 I camped high above the beach at Island Vibe Backpackers. In my opinion, the Garden Route could be extended to the east. And the usual uphills and downhills. The wind gave me a lift on the last few kilometers to Port Elizabeth.